Create awareness of the issue that homeless people need socks more than any other article of clothing. 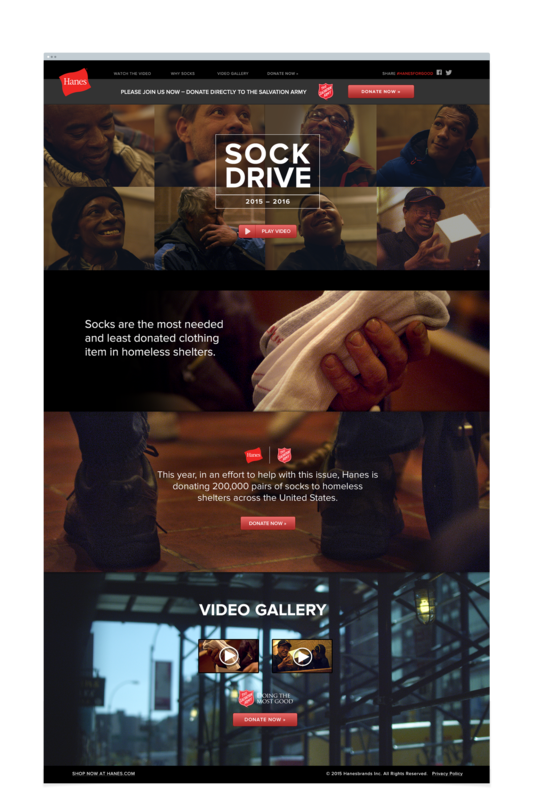 Bring attention to the feet of homeless people in a tasteful, meaningful and engaging way as well as create awareness of how Hanes is helping this issue with their large sock donation to The Salvation Army every year. Socks are a holiday gift we often take for granted, and means so much to the homeless. By creating videos that center on the need for socks, the true meaning of the holiday season was put into perspective. We were also tasked with producing a web page created under the HanesForGood.com domain. We created a short and sweet webpage that easily communicated the issue, how to participate and displayed all our video content.